Every time I do a hive inspection, I end up killing a few bees. I try to go slowly when I’m cutting the comb away from the sides, but sometimes the bees just don’t want to get out of the way and get crushed. Other times, I accidentally crush a bee or two when I’m pushing the top bars back together. I try to smoke them or jostle them out of the way, but just as I think they are safe and squeeze the bars together, one will inevitably scurry up and get crushed. I hate the scrunching sound that I hear and feel. In these cases, there are just a handful that get killed, but it pains me just the same. The worst cases are when a comb collapses and honey runs all over the hive, trapping dozens of bees in it’s stickiness and drowning them. Or when I need to do an emergency harvest and have to put the comb in the bucket quickly before it drops on the ground and many bees get caught in the process. 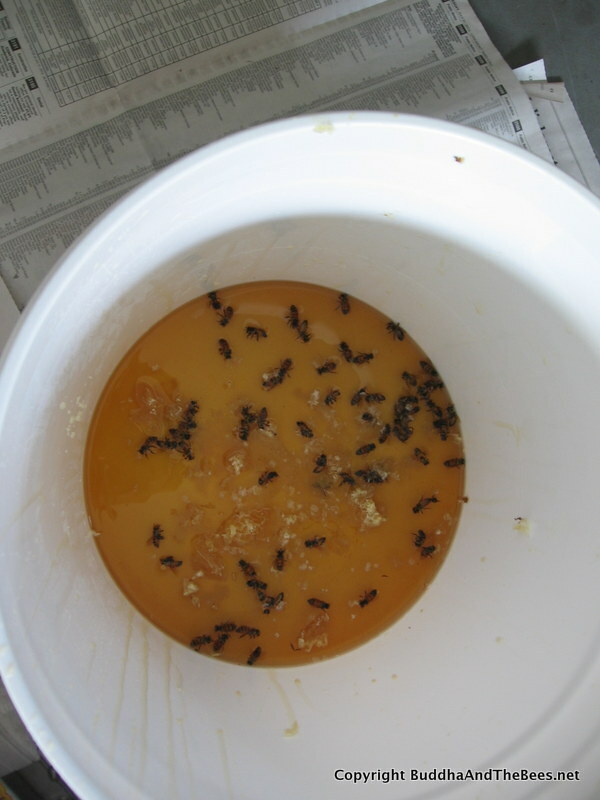 I try to save as many as I can – scooping out the ones that I think have the best chance for survival, putting them on a bucket lid on the back porch and hoping that they can clean the honey off each other and fly back to the hive. Some make it, but most don’t. 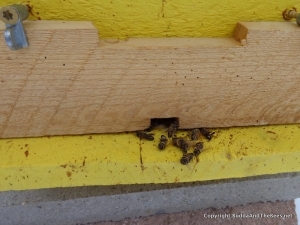 In the height of the summer, the hive can have over 40,000 bees in it. Going into winter, the number of bees reduces down. First, they kick out all the males. I feel sorry as I watch the workers drag the big drones out of the hive, dump them on the ground and keep them from getting back in. Then comes the deaths from the cold. We had a week in December when the temperature was below 10F for almost a whole week. After that, there were 100-200 dead bees out in front of the hive. But when the weather warmed up, I watched a few thousand of the remaining bees take their cleansing (“poop”) flights, so I new there were still a few left. This last week, we had a low of -10 and it’s been below 40 for most of the week. As I mentioned in my last post, the bees on the outside of the cluster might die (here’s a nice description I found of the winter cluster) and sure enough, this week I found the entrance plugged up with dead bees. Today when I looked, the plug had been removed and there were a lot of dead bees on the snow out front. The caretaker bees had been busy. I saw one bee fly out when I was taking the picture, but it’s not really warm enough for cleansing flights. I can only hope that there are still a couple of thousand bees left. The population will keep decreasing until about March when the queen will start laying brood in preparation for the spring blooms. Even then, their survival depends in part on the weather. 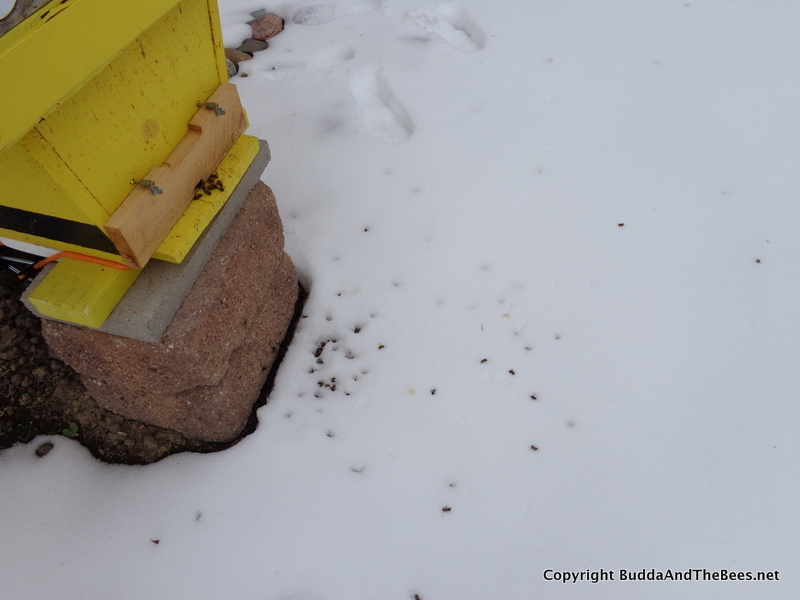 Last spring, late snows and cold killed the fruit blossoms and with it an early season food supply leading to some hives starving to death. Death has been on my mind the past few days. My father-in-law passed away this week 2 days short of his 78th birthday after being in the hospital for several months. My dad (85) is in the hospital, mending from a broken hip, but there is always the fear of infection and his mortality. (Fortunately, his mother lived to be 102 and her father to 98, so I’m hopeful he has those genes.) And, I’m now probably in the last half century of my life, so I occasionally think of my own mortality, especially when a family member dies. All I can do is be grateful for the life we have and say a little prayer.